The Breakdown: Does BU or North Dakota have the advantage in the NCAA Tournament? The four teams settled in Fargo, North Dakota this weekend all have one goal in mind — reaching the Frozen Four in Chicago in early April. Before getting there, though, three will see their 2016-17 seasons come to a close, all while one dances one step closer to an NCAA title. Friday evening will see No. 3 University of Minnesota Duluth and No. 14 Ohio State University duke it out, but Commonwealth Avenue will have its sights set on the preceding clash. On Friday afternoon, the No. 6 Boston University men’s hockey team and No. 10 University of North Dakota will meet at Scheels Arena and bring together a combined 21 NHL draft picks. Mindful of that, a special play here or a moment of brilliance there could very well be the difference between the Terriers (23-11-3) and Fighting Hawks (21-15-3). Thus, The Daily Free Press has broken down the difference makers at vital spots and determined who has the edge. 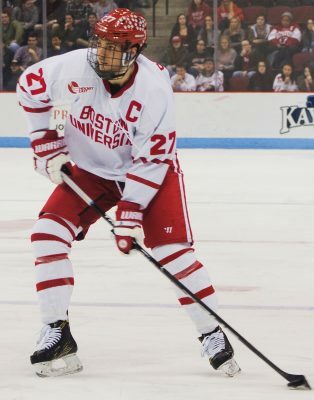 BU: Head coach David Quinn’s side has arguably the most-gifted top two lines in college hockey. The first typically shapes up with freshmen Patrick Harper and Clayton Keller and sophomore Bobo Carpenter, while the second has sophomores Jakob Forsbacka Karlsson and Jordan Greenway and senior Nick Roberto. Between them, the sextet has accounted for 182 of BU’s 318 points and includes five NHL draft picks, with Roberto being the sole exception. 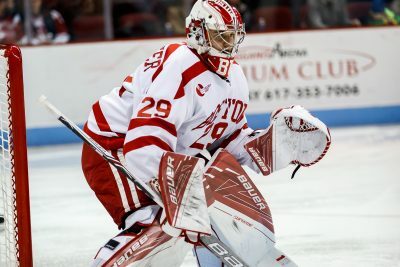 Keller’s the cream of the crop, as the Arizona Coyotes first-rounder from 2016 was recently named Hockey East Rookie of the Year. If BU has one flaw, it’s that its bottom two lines have struggled to put up points. Save for freshman Kieffer Bellows (14 points), none of them can really be classified as a goalscorer. ND: Much like BU, North Dakota is loaded with high-level talent in its forwards with stars like sophomore Brock Boeser and freshman Tyson Jost. The former, an American and Vancouver Canucks first-rounder, has 33 points on the year, while the latter, a Canadian and Colorado Avalanche first-rounder, has put up 35 points. The buck doesn’t stop there, though. Sophomore Shane Gersich has exploded onto the scene in 2016-17 to the tune of 37 points, and junior Austin Poganski is ever reliable, already pushing the 70-point mark in three seasons in Grand Forks. 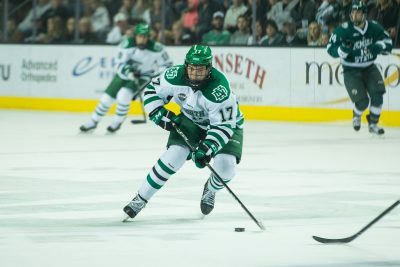 The aces up North Dakota’s sleeve might just be Joel Janatuinen and Rhett Gardner, two sophomores who have fired 75-plus shots on goal across the regular season and playoffs. With so much focus on Jost and Boeser, they could rise to the occasion. 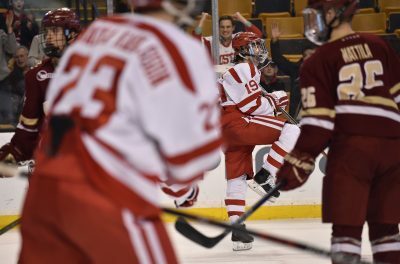 BU: The oft-overlooked part of BU’s team is just how talented its defensive corps is, all despite featuring six NHL draft picks. Keep an eye out for sophomore Charlie McAvoy, a Boston Bruins first-rounder who was also an assistant captain on Team USA’s gold-medal winning team at the 2017 World Juniors. The steadying, defense-first presences of senior Doyle Somerby and John MacLeod are often reassuring, too. Then there’s the offensive potential of junior Brandon Hickey and freshmen Dante Fabbro and Chad Krys. They offer a little bit of everything and are leading reasons why BU allows only 2.27 goals per game. ND: Head coach Brad Berry’s defensive corps arguably deserves more credit than it gets. North Dakota has allowed just 2.56 goals per game in 2016-17, with much of that coming in National Collegiate Hockey Conference play. The star player along the blueline is Tucker Poolman, as he’s chipped in 30 points during his junior campaign. Two other dangermen are Gage Ausmus, a senior captain, and Colton Poolman, a former defenseman with the Penticton Vees of the BCHL. BU: If there’s one spot in which the Terriers have a definitive edge, this is it. Freshman Jake Oettinger will get the start between the pipes, and he’s proven his worth, earning a spot on the Hockey East All-Rookie Team. The Lakeville, Minnesota native has had his fair share of ups and downs, but that’s to be expected from someone who turned 18 in mid-December. Otherwise, he’s been stellar, putting up a .927 save percentage and 2.09 goals against average. ND: North Dakota’s go-to guy is Cam Johnson, a junior who’s had an off year in 2016-17, one season removed from being a finalist for the Mike Richter Award in 2016. He’s put up a 2.38 goals against average and .904 save percentage, starting all but three of the Fighting Hawks’ games. Those are hardly numbers to scoff at, but a deep NCAA run typically requires stronger goaltending. All things considered, these two teams are neck-and-neck across the ice. Upon initial glance, however, Oettinger gives BU a slight advantage over North Dakota. My prediction? A 3-2 win for the Terriers. Author: Jonathan SigalJonathan's a New Englander who writes about sports, features and politics. He currently covers men's hockey at BU, worked as Sports Editor during the spring 2016 semester and is on the FreeP's Board of Directors. Toss him a follow on Twitter at @jonathansigal. BU, the youngest team in the league and playing against the defending NCAA champ, will have to bring its best game against ND playing in front of what amounts to a home crowd. If they don’t, it could get ugly. BU has outranked ND all year and is capable of winning if they play their game. GO TERRIERS!